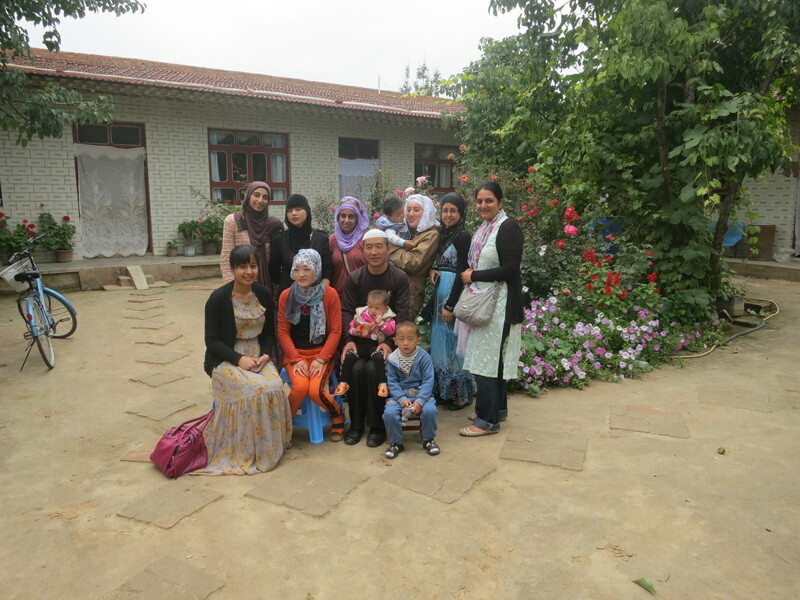 In September 2012, myself, along with my friend, Rabea, from Australia, and my friends Tanveer, Ambreen, Shazia and Rachida, all from the UK, took a tour of China with tour company IslamiChina. The tour spanned just under two weeks and included all the major Chinese landmarks including the Great Wall, Forbidden City and Terracotta Warriors. The tour company is a halal tourism operator, focusing on Muslim tourists and also offering their customers with the opportunity to visit Islamic communities and monuments in different Chinese cities. This feature will include an account of my travels, some background history on Muslims in China and will also review the tour company we used. It is long and detailed, but I implore you to read this installment through, as well as installments to come because the trip just gets better and better as each day passes. Alhamdulilah. Rabea and I had made the perfect travel companions, alhamdulilah. The story of how we met the year prior, on Mount Uludag in Turkey whilst attending the Deen intensive Rihla, is one we often recount with fondness. There was something (mostly the barakah present) about the connections I had created whilst at the Rihla that allowed for long-lasting and meaningful ties with her, as well as many other Rihla friends. Prior to attending the Rihla in Turkey, I went on a Muslim women’s tour of Spain with the other girls from the UK. We had stayed in touch and decided it would be fun to go on another tour together. Rabea and I flew to Beijing together, reached Beijing before midnight, and rested up. The following morning we went on a long walk around our hotel surroundings. The hotel was conveniently located in the centre of Beijing, and Tiananmen Square was walking distance. We walked through the market areas of central Beijing and familiarised ourselves with the bustling capital of the most populated country on earth. One slightly strange memory Rabea and I share of this walk was seeing an old man in his wheelchair, comfortably wheeling himself, un-aided, completely backwards for metres and metres without looking behind for guidance once. We found this quite impressive, but unusual and confusing. 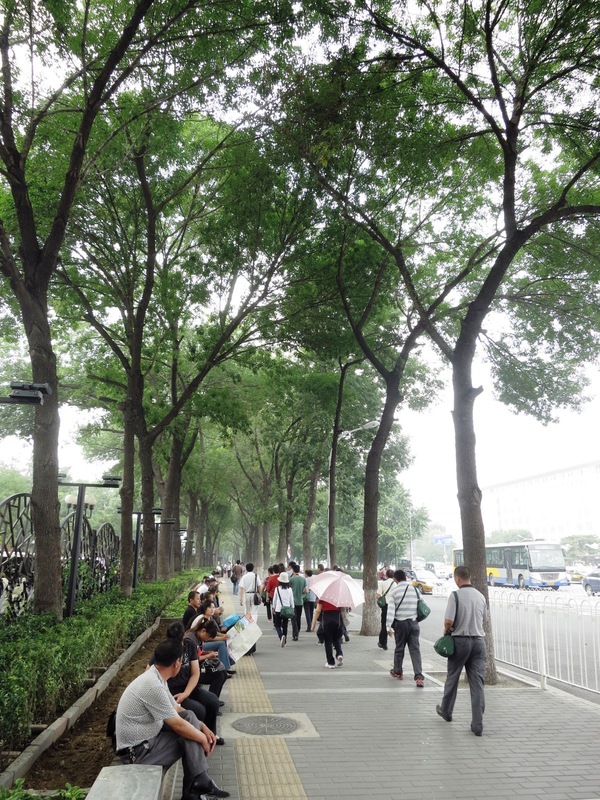 We immediately realised how safe we felt as two young females in China. 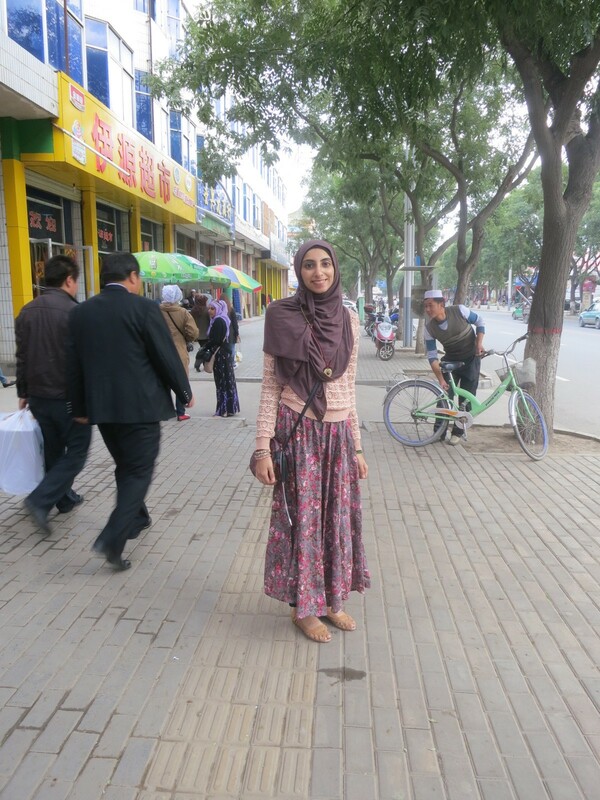 In Beijing at least, I did not feel as though I was attracting much attention as a hijabi. This may have a lot to do with the presence of Chinese Muslims at every corner you turn. Muslim communities can be found in every province of China, including the remote coastal Islands. 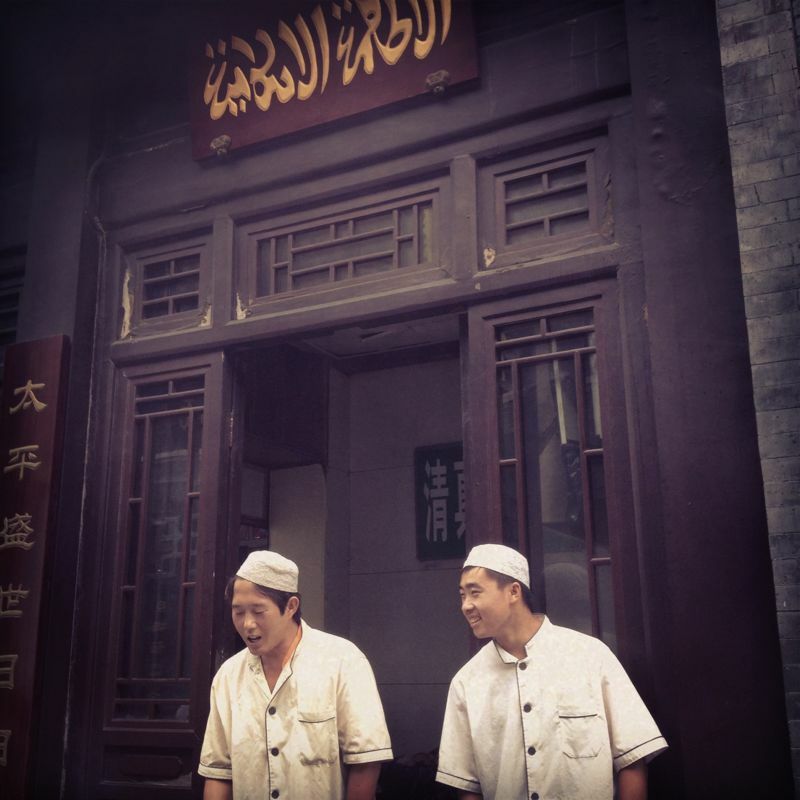 Apart from some brief reading about the Chinese Muslim population, I did not fully anticipate what it would be like to witness a very noticeable Muslim presence everywhere I went in China. Muslim Street Vendors. The Sign in Arabic says, "Islamic Food"
In Beijing we saw a lot of men wearing traditional Hui kufis on their head and there would be many street food vendors selling kebab sticks. As delicious as it looked and intrigued we were, we did not feel confident enough to eat street food in China as we feared it wouldn’t go down well in our stomachs. A 2009 study undertaken by the Pew Research centre determined there are 21,667,000 Muslims living in China. There are 10 officially recognised different groups of Muslim minority peoples in the country. In order of population size, they are the Hui, Uyghur, Kazakh, Dongxiang, Kyrgyz, Uzbeks, Salar, Tajik, Bonan and Tatar. The most predominant of the groups, the Hui, are very similar ethnically and linguistically to the majority group, Han Chinese, yet their Islamic faith sets them distinctly apart. Later that day I re-united with my British friends and we all caught up over dinner at a delightful Hui restaurant. We were then treated to a Chinese Opera performance. It was entertaining and highly amusing. Our next day would be a full one and we all went back to our hotels, rested and anticipated the day ahead. The next morning, the girls and I set out to a local shopping centre to purchase a Chinese sim card. This was a pretty straightforward process, and despite not being able to communicate to anyone in a common language, we managed to walk out with our sim cards activated. The thing was, though, that internet service wasn’t that great in most parts I travelled to in China, except Shanghai and Hong Kong. We could not access facebook, as it is banned in China, and had to communicate with family and friends via viber or text message. First stop for the day as a part of our tour was Tiananmen Square. We were taught about the significance of the landmark in its official sense, but couldn’t help but associate our own historical and political meanings to the square with what most other westerners would. It was large, crowded, and covered with large paintings of past and present Chinese rulers. One of the first things you will notice in China when visiting a touristic sight, is the majority of tourists are Chinese people from various provinces. The very-organised tour groups often wear matching clothing or colours to distinguish themselves from other groups, and there is often a leader or two amongst them who carries a coloured flag for easy spotting. Our next stop for the day was the famous Forbidden City, which is connected by a gate through Tiananmen Square. 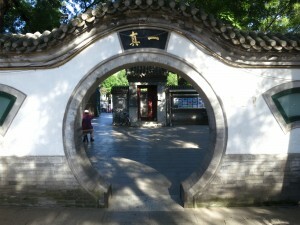 It is famous in the Western world mostly by its use as a setting in many Chinese and Kung Fu action films. The World Heritage listed site served as the Imperial palace for twenty-four emperors in the time of the Ming and Qing dynasties. 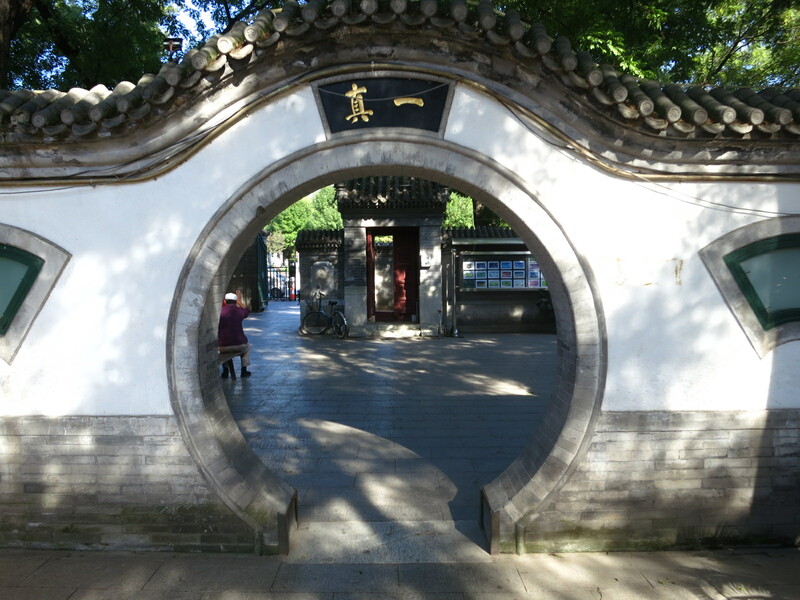 It is a nice long walk through the Chinese Palatial style complex, passing through each of the gates which are recognised by UNESCO as the largest collection of wooden structures in the world. Our first visit to a Chinese mosque was this day as well. In Madian Mosque we were all spellbound by the exposure to the kind of mosque which had familiar elements, but also encompassed uniquely indigenous characteristics. When entering the mosque, we walked under a circular archway, an architectural feature very common in traditional Chinese buildings. We took in the vibes of the mosque by exploring its rooms and walking through its beautifully painted walls. We marvelled at seeing our first ever copies of the Quran written in Chinese, along with much other literature on bookshelves in the Chinese and Arabic languages. We were then taken to the Fresh Water Pearl Centre by our tour guide, Michael, and our driver. What is almost a given in any Chinese tour package is the inclusion of visiting local tourist-aimed shops and cultural centres. The tour guides are usually given a commission for any purchased items and so you may sometimes feel an awkwardness when attending these shops/museums and centres. You may want to look and touch, but find the goods sold at the very tourist-focused prices, are not exactly what you’re after. If you do like those almost imposed shopping detours, then you will love it. My advice is to try not to feel too pressured into buying anything you’re not interested in buying, but also understand the activity for what it is – these guides are just trying to make a living and your purchase power is simply a part of that system. Later that day we visited the Summer Palace. This would have to have been the highlight of the places we had visited so far. 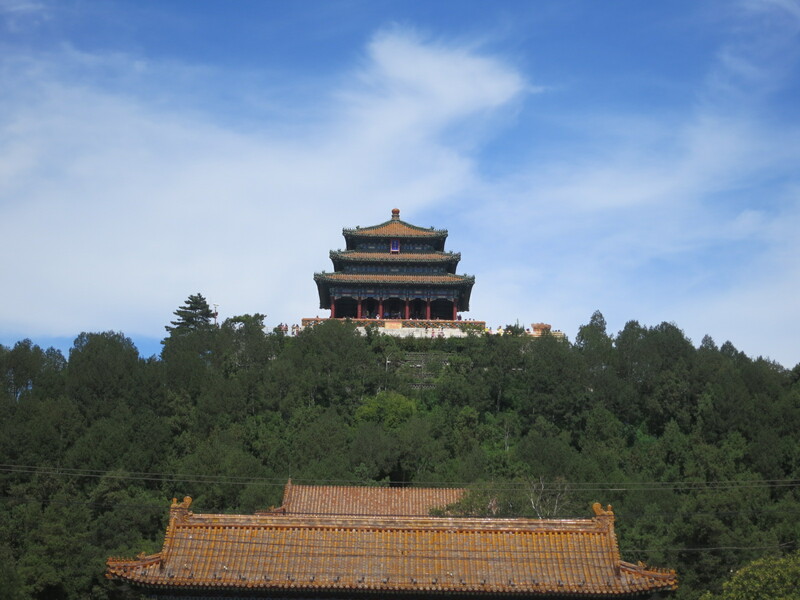 The Summer Palace is an historic complex of palaces, gardens, lakes and temples serving emperors of the past. It is a testament of classic Chinese landscape designs and entices one with its calmness and serenity. The tourist dominated parts of the palace are fun filled with local performers, stalls and the chance to sit quietly by the lakes and take some nice photos. Day four was one of the most momentous days of our trip, we were off to walk the Great Wall of China! On our way to the Great Wall we stopped by the Jade Museum. Jade has a strong cultural significance in China as it was seen to be a stone containing virtue according to the teachings of Confucius. It is regarded for its beauty and remains a very popular material for making ornaments. We accessed the Juyongguan section of the Great Wall, which stands approximately 60 kilometres from Beijing. The wall is situated in a lush green valley surrounded by Mountains and upon first glance your breath is taken away by the winding lengths of the grey stone/brick structure. The Juyongguan pass was built during the Ming dynasty (1368-1644), and makes up part of the greater wall which was built during dynasties across what was historically recognised as Northern Chinese borders. They were epically built as a defence strategy against invading nomadic armies from the Eurasian Steppe. Great Wall of China, Juyongguan Section. I was feeling unwell by the time we got to the wall. I had an upset tummy, which is expected for me when I travel, and I was feeling quite weak. I felt so weak that as excited as I was I was slower than my peers in climbing what felt like a millennia worth of stairs. It became a mission to reach a particular length of the wall we has decided on. I kept looking behind me every time I reached a different watch tower, and was encouraged by the girls to keep moving forward. And we did! We got incredibly far and I felt very happy at the distance I was able to cover given my limited strength at the time. I felt the weight of the history I was treading upon. It felt surreal to be walking across the Great Wall, one of the most revered wonders of the world. The light winds were exhilarating and I had one of the most fun experiences of my life. 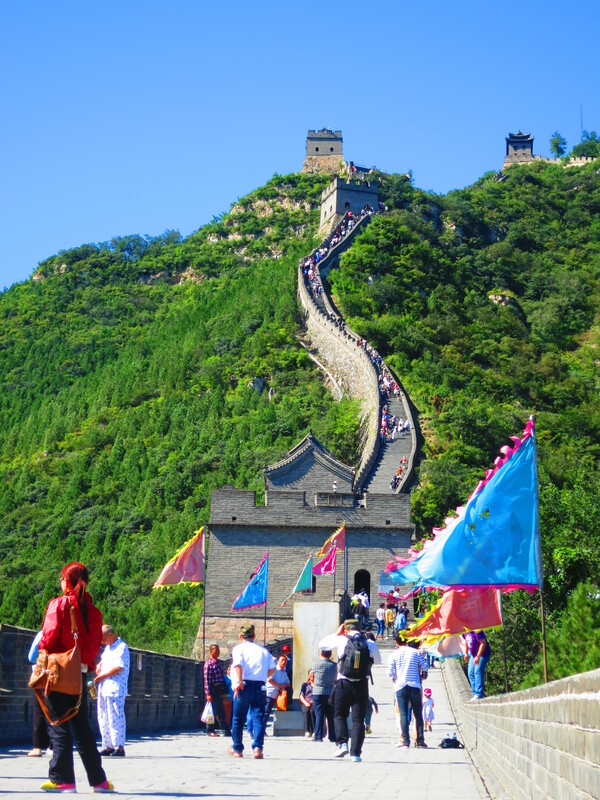 By the time we got back to the tour bus after buying little souvenir items including proud tshirts exclaiming, “I climbed the Great Wall of China”, I was very spent and needed to rest. The rest of the girls got off to be shown the Ming Tombs Sacred Way, while I stayed back and napped in the van. I felt better for it, and somehow over the next couple of days regained some of my strength again. Day 5 we would be spending the morning in Beijing sight-seeing before we would fly to Lanzhou in the afternoon. It was Jummah, and we first visited the amazing Temple of Heaven. This is a must see. 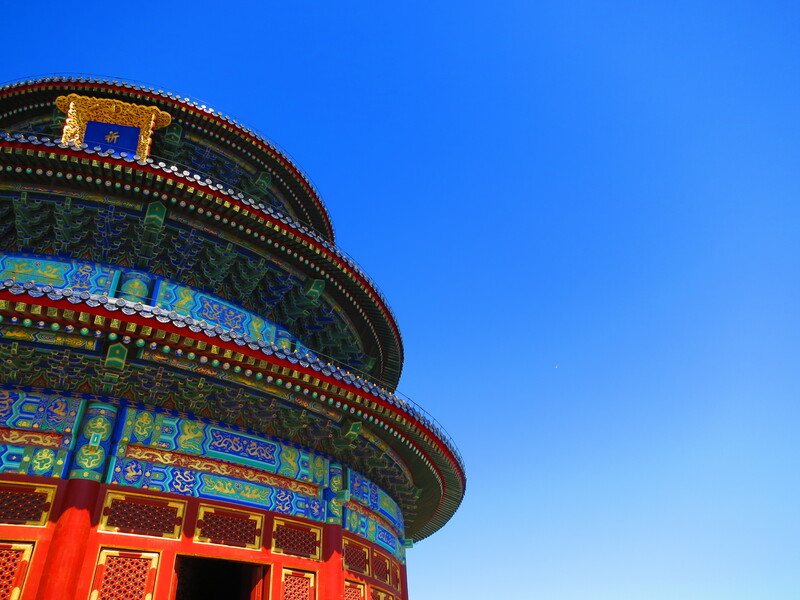 The Temple of Heaven was a religious place of worship predating Daoism. At the centre of the temple lies the ‘Hall of Prayer for Good Harvest’ which captivated me as I circled it with the girls admiring the magnificent cobalt blue, red and gold exteriors. 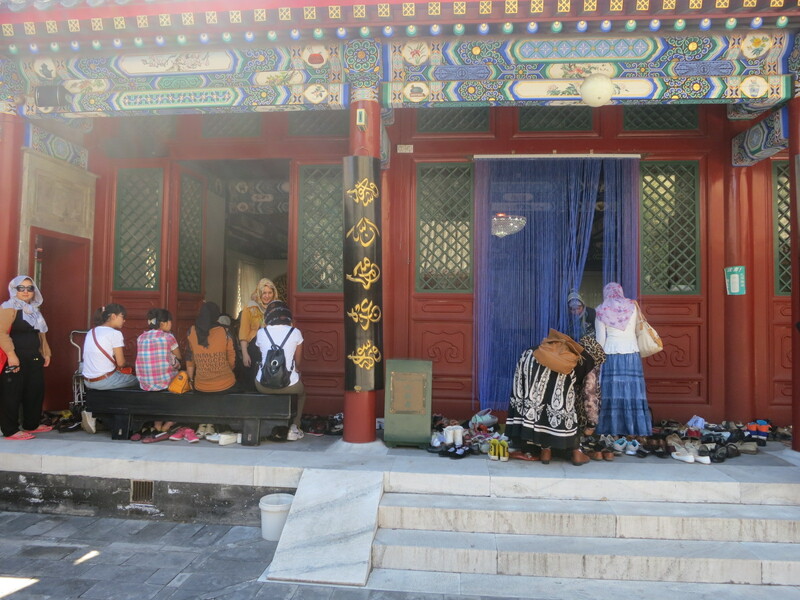 We then went on to witness a Jummah in Beijing’s most famous and oldest mosque, Niujie Mosque. Built in 996 during the Liao dynasty, the mosque was reconstructed and extended in the 1600s. Located in the Niujie area of Beijing’s Xicheng District, the mosque serves the area’s approximately 10,000 Muslims. As prayer time loomed, we made wudu while observing locals start to congregate in time for the khutbah. And so we sat in the women’s section and listened with equal respect and wonderment at a khutbah delivered fully in Mandarin with the occasional familiar word such as ‘Muhammad s.a.w’ providing (in our heads) interesting contrasts of language. I sound ignorant of the long standing history of the millions of Chinese Muslims adopting Islam into their existing culture and language, and that’s because I was ignorant. I had never met or mingled or observed Chinese Muslims in my whole life. My primary knowledge of the Chinese was a Han Chinese, Buddhist/Confucian, Non-religious and even Christian – centric Chinese identity. 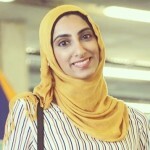 Gaining this exposure taught me more about the diversity of Muslims across the world, and the richness each culture has to bring to the Ummah. I remember playing with a young Chinese Muslim girl in the masjid courtyard, with her little brother. It’s kind of fun to play with children when they can’t understand you and you can’t understand them. The only phrase I would pronounce with confidence in Chinese was “nǐ jiào shénme míngzì?” (What is your name?). The communal atmosphere after prayers was nice to watch, as local Muslims passed in and out of the mosque surrounds, chatted and went about their business. We couldn’t help but note police presence outside the mosque, a practice we assumed was a regular measure around China. Our tour guide then took us to a place they called the Muslim Market, basically a fresh food and grocery market which was part of a bigger mall. I imagine it housed halal ingredients for Muslim locals, as well as ingredients that were used for local Hui cuisine. We stocked up on packaged snacks to get us through long travel times and to try out some of the local treats available. It was now time to head to the city of Lanzhou (Lan-Jo) of North-Western China, in the Gansu province. 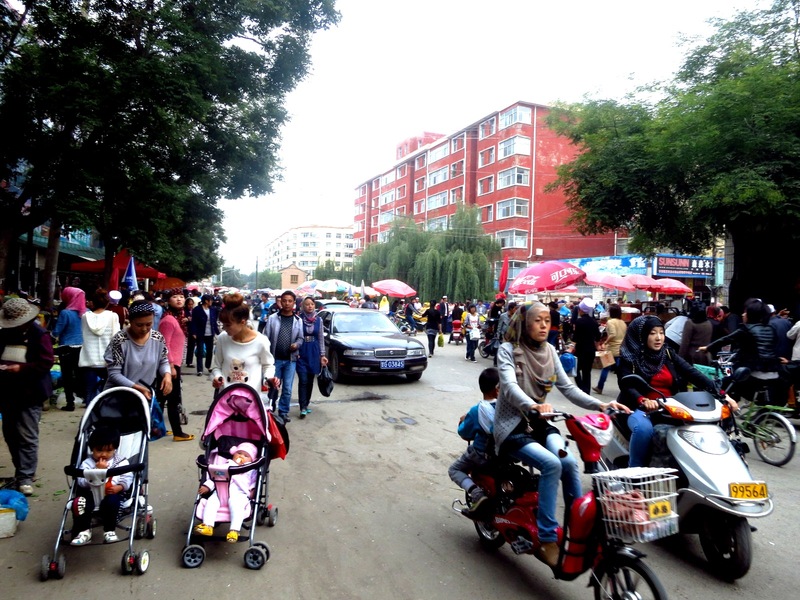 Lanzhou formed part of the ancient Silk Road, and the province boasts a significantly high population of Muslims who have ancient links to the region. We arrived in Lanzhou airport late at night, and met our tour guide, Yom, at the airport. Yom was to become our favourite of all our tour guides. She was young, confident, relatable, amazing and she taught us so much in the short time we spent with her. Rabea gave her the respectful title of “The PhenomYom”. It was cool to hang with a female of a similar age and talk about things like career, culture and relationships and draw so many parallels in each other’s lives. She said that she was used to Muslims because two of her best friends were Muslims. But more on our amazing tour guide, a little later. So we reached Lanzhou quite late, hot (well actually cold, Lanzhou was chilly) and bothered because our flight was probably delayed. Domestic flights in China are almost always delayed. Mostly because the Chinese military air force gets very high air-space priority and it drives a real flight delay problem. It was dark and we were rushed into our tour van and driven a long distance to Lanzhou city centre where we checked into our hotel and got some much needed sleep. The next morning we drove to Linxia (Lin-shya), a city located in the valley of the Daxia River. 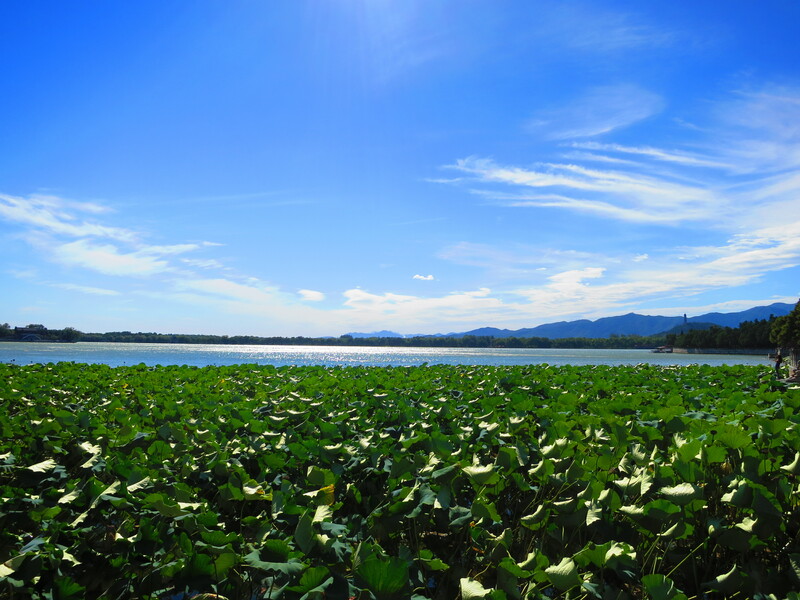 The two hour drive from Lanzhou allows a most scenic view of the valley and mountainous region surrounding Lanzhou. The terrain is desert-like with a slight chill during the month of September, which we were travelling in. The drive is incredibly beautiful mostly because of what you get to see on the way. Every few kilometres or so you will see perched up in the mountains the most beautiful which appeared to have a strong Mughal influence in their design. The mosques are so numerous we couldn’t keep count of how many we saw in our joy and amazement. I tried to imagine the smaller communities that made up part of the greater Linxia county, and what it would be like to frequent masajid that are perched high in beautiful mountainous villages. Just as we were about to approach Linxia city, our tour guide, Yom, halted the bus driver to stop in front of the home of a completely random Chinese Muslim family. Yom was very cool in that way, and distinct from our other guides because she tried to let us have the most authentic experiences of the areas we visited with her. She asked permission from the family if some visiting tourists could enter their home for a brief chat. The family were comprised of a young couple; husband, wife, a son, and their youngest, a little girl. There were also extended female relatives in the house at the time we visited too. They were happy to welcome us into their home and tell us a little bit about their lives. We learned of some of the conservative cultural practices amongst many of the observant Hui families in the area. It was custom, for example, for women not to leave their homes without the company of their male relatives. We also learned that in particular remote or minority communities, the Chinese government relaxed their one-child policy and therefore the Muslims of the area would have bigger families. The family literally broke bread with us. They had just baked some fresh bread that was shaped and textured slightly like cookies. I never got to learn what this food was, but it seemed to be a staple, and was quite tasty. We played with their children in their very beautiful garden and luckily I had thought to pack toy koala/kangaroo stuffed toy gifts with me to gift to any children I met on my journeying. We took photos with the family and bid our farewells and thanks, keen to finally reach Linxia city. For centuries, Linxia has been a significant hub of China’s Muslim community, and is nicknamed, “The Little Mecca of China”. 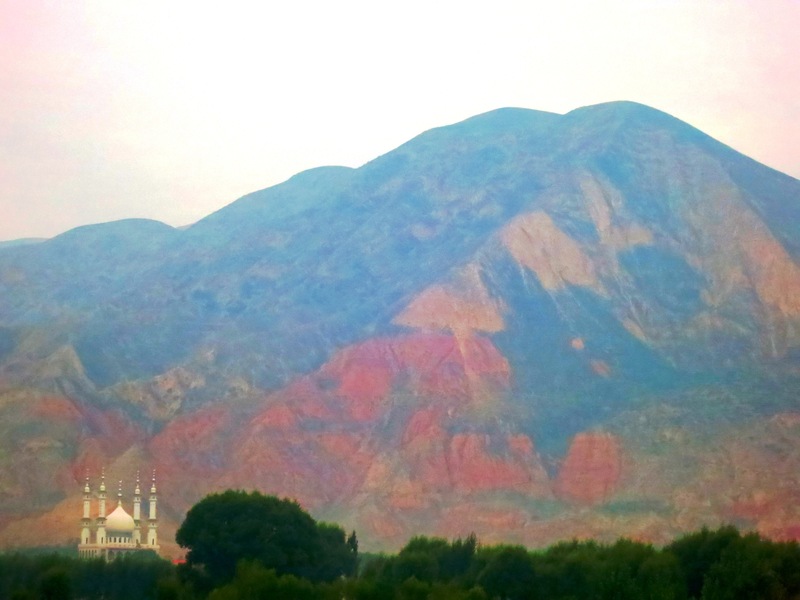 Linxia is home to China’s Qadriyyah and Khuffiyah Sufi orders, with many mosques and madrassas present in the city and its surrounding villages. Yom told us that the two main Muslim groups we would find in this region were the Hui (of Han Chinese ethnicity) and the Salar Muslims (of Turkic origin and differing language to Huis). The Muslims here are quite easily identified. The men often have short beards and wear white kufis. The women wear a distinctive style of hijab. It is a kind of velvety black flower patterned-hijab which is shortly cropped and easily donned for practicality. The rest of their outfit follow mainstream Chinese fashions that are chosen to cover full legs and arms. The other type of head covering I saw on women was a kind of elongated lavender coloured kufi, with their fringes showing. Yom told us that mostly married women will wear this second style. 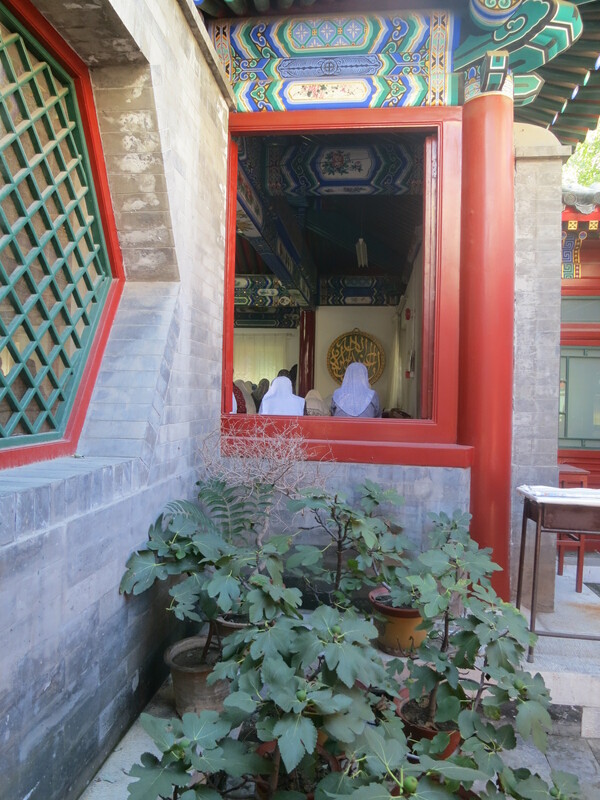 Our short time in Linxia was spent wandering the streets of the city centre and briefly visiting a madrassa. I enjoyed wandering the streets the most. Observing the Muslim culture there was fascinating, and I loved that the city didn’t have much of a tourist vibe at all. I shopped with Rabea in a street with so many cool antique shops, bought some antique Chinese coins and ogled at other items of interest. Some of the coins had Arabic script on them so I imagine they may have originated from East Turkestan (aka Xinjiang province). I also noticed a beautiful looking Sufi shrine complex close to the city centre which I found out later was called the “Yu Baba Gongbei”. If you get the chance to visit Linxia, you should also visit the “Hua Si Gongbei” mausoleum of Ma Laichi, one of the most influential Chinese Muslims. Ma Laichi was a scholar who lived and taught under the Naqshbandi order in the Gansu province during the 1700s. 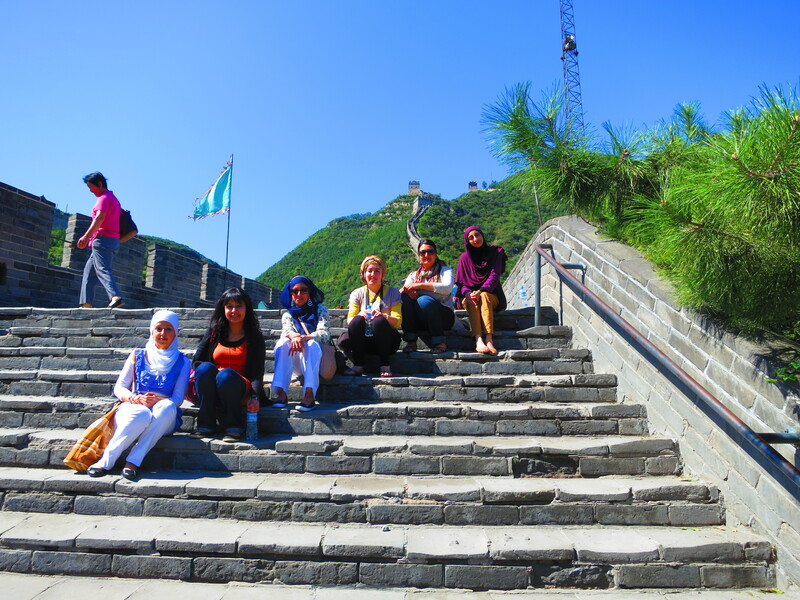 In Linxia, we got more attention as a group than in any other place in China that we visited. We had people in the shopping malls excitedly ask to take photos with us, we also had an English speaking Hui woman who came up to us explaining that she used to live in Pakistan and invited us over for dinner. I’m the type of traveller that is very keen on making friendships with locals and other tourists when I travel. It always gives me good memories, otherwise unattainable knowledge, and often useful links to a place. As tempting as the offer was, we used our judgement to remain cautious not to follow around people whom we didn’t know. Decisions with these types of things can usually change, though, depending on the different circumstances as well as your instincts. We also received quite hospitable treatment from restaurant owners who wouldn’t let us pay when we ate there. They told the tour guide that they were very happy to see us and that we were their honoured guests. These types of encounters really make a trip special. The baraka of meeting with Muslims both as a host and as a traveller in all sorts of places around the world, seems to attract a universal reaction. It’s beautiful to be a part of this practice of hospitality, generosity and brother/sisterhood that spans centuries and roots itself in the Sunnah. We drove back to Lanzhou the next morning. The drive back was amazing all over again and I felt I had been really treated by being able to visit such a blessed and thriving community, mashaAllah. The people there weren’t too used to seeing Muslims of different nationalities, so I felt quite happy to be travelling to a slightly off-the beaten track location amidst the usual destinations a Chinese tour would involve. 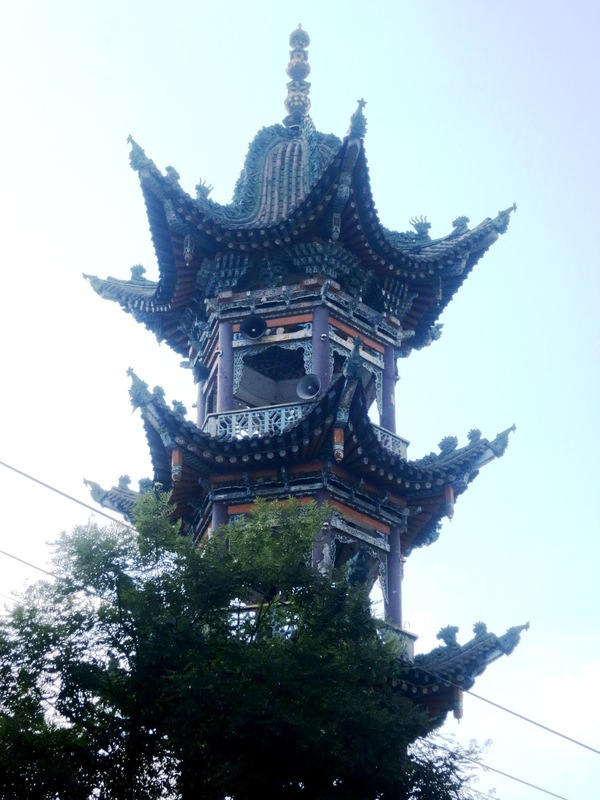 The remainder of our time was spent visiting the Xiguan Mosque (in which it appeared women were not usually allowed admission) as well as the Water Wheel Park, which was pretty cool. A lot of the mosques we visited in China bore plaques and pictures sometimes acknowledging local governors and government officials who had commissioned the mosque for the community. We grew to realise more the complicated relationship between the community and the communist government of the time. Our questions only grew throughout our time in China, and were not easy to have answered. To top it off, we witnessed a massive pro-government rally in relation to a Chinese/Japanese dispute in our final few hours in Lanzhou. The last thing I remember doing in Lanzhou is going to a Muslim restaurant to try the region’s infamous Lanzhou beef noodle soup. It was really, really, good - my favourite dish in all my time in China and I was determined to learn to make it myself when I came back home (this has still not eventuated). I really recommend trying halal beef noodle soup when you visit China. 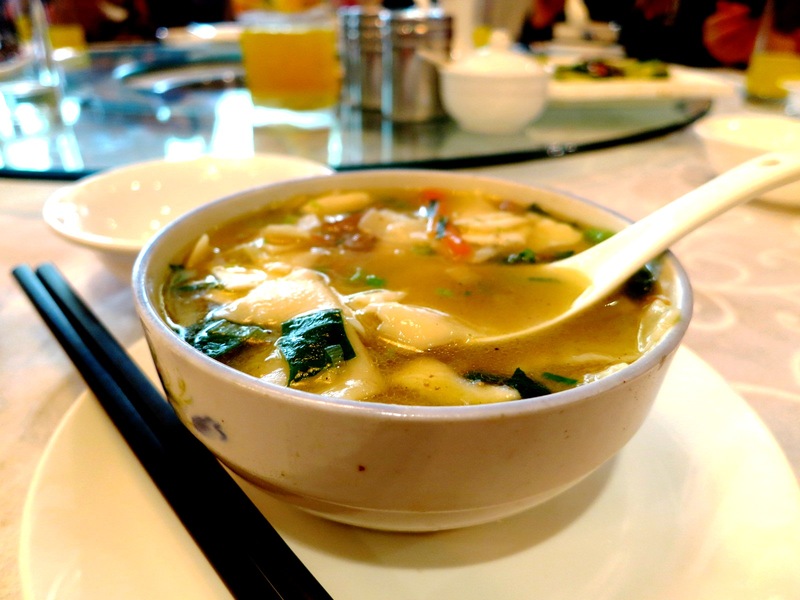 Halal restaurants are easy to find in Lanzhou as well. Saying goodbye to Yom was hard. I felt incredibly blessed to have a tour guide like her, and as was tradition, we tipped her well for her services as a tour guide. It was also a sad goodbye to our mini-bus driver. He was an endearing old Chinese man whom we had to communicate through Yom with. He told us were like daughters to him and that he had had an excellent time taking us around. 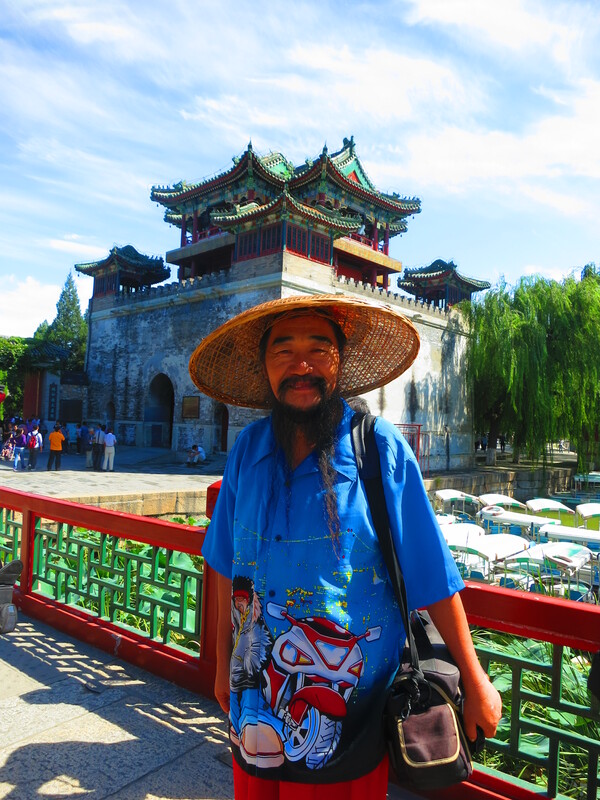 He had made us laugh many times during the journeying through the Gansu province, a very amusing and respectable character. So we said our good byes at Lanzhou airport and flew to the next amazing segment of our journey: Xian.